Google rolled out a number of best practices so that advertisers can improve the Google Ads optimization score. Optimization score is a metric that evaluates how good your Google Ads campaign is optimized. This was introduced in August 2018. The credentials of the score range between 0 to 100%. Google provides the following three best practices to improve your optimization score. Users need to prioritize the action which highest potential improve optimization score. 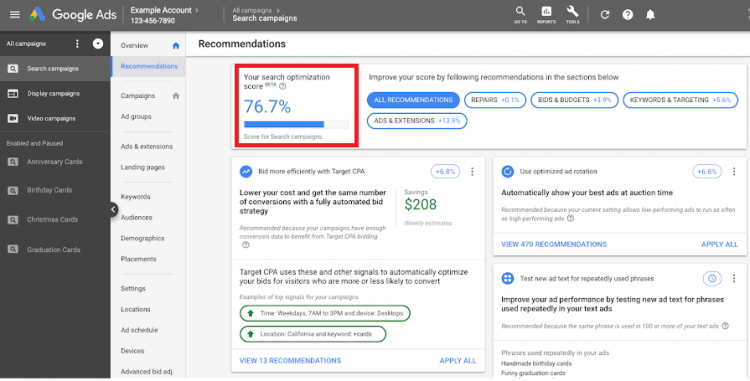 Google Ads gets easy by recommending the best most impactful optimizations for an account. Optimization scores depend on historical performance, and machine learning to make recommendations. Get the top of the latest recommendations checking them regularly. Recommendations are available for offline analysis. Users can download them.